This lovely polo is one of those pieces you can mix and match right the way through to Summer. 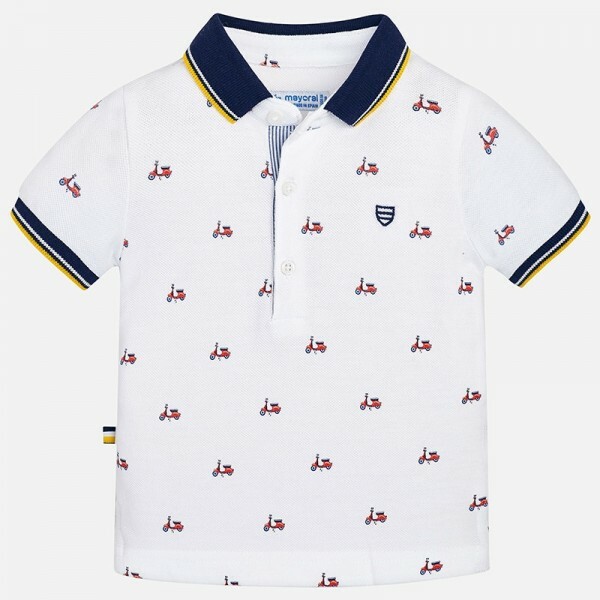 Made by Mayoral in white and navy cotton piqué, the polo shirt has an all over scooter print, finished with a blue ribbed collar and cuffs and trimmed yellow stripes. Smart, stylish and genuinely unique, it's a warm weather shirt he'll never tire of wearing. It's a great piece for any occasion, either with shorts for a sunshine day or dressed up for a special event. The details are lovely - little racers will love the striking scooter print. It's a polo shirt with a style that you just don't see every day, so your little man will be able to rock a really distinctive look this season.